FOR tireless Pyramid Power president Jimmy Floyd, all the hours as well as the blood, sweat and tears he puts into his club felt worth it on ­Saturday afternoon. 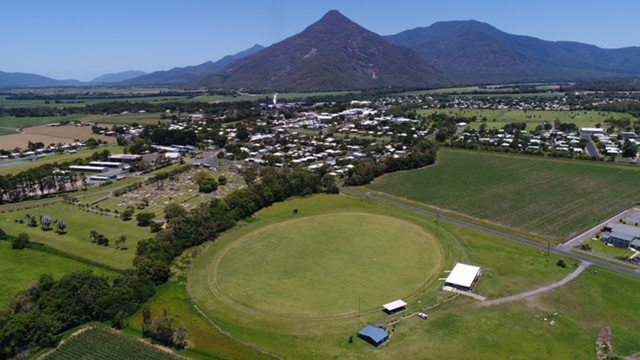 After three seasons in the reserves competition, the Gordonvale-based Power lifted their first ever premiership with a hard-fought victory over Port Douglas on Saturday afternoon, 12.12 (84) to 10.7 (67). Big forward Daniel Mooka was the star, kicking seven goals in a best-on-ground performance. “To go in and take the premiership, like we have done, in a season that had so many ups and downs, is huge for us,” Floyd said. Pyramid Power players Edward Nawakie, Edward Anau, Dom Bryan and Chris Wray. PICTURE: STEWART McLEAN. “These boys kept on pushing through and we have supported each other through the hard times. The Power established the premiership triumph with a five-goal blitz early in the second term through four majors from power forward Mooka and a Stephen Schrieber goal. The Crocs called for a rare headcount late in the third, suspecting the Power had too many men on the field, which the umpires found they did not. From the free kick from calling for an incorrect headcount, Power skipper Danny Floyd kicked a goal to seal victory.